For more detail please find the product catalog below in attchement. - This apparatus is useful for determining the harden ability of steels by end quench test. This apparatus is used for determining the Hardenability of steel by an experiment called Quench Test. This experiment will enable us to know about the Hardenability characteristics of different alloying element. Design as per IS standards. Stainless Steel Tank. We have carved a niche amongst the most trusted names in this business, engaged in offering comprehensive range of End Quench Test Apparatus. · Motorized water circulation through ½ HP water pump with storage Tank and Test tank. 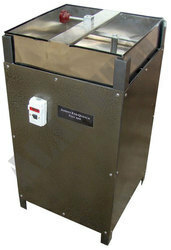 The apparatus is used for determining the Hardenability of steel by an experiment called Quench Test. this experiment will enable the student of know about the Hardenability Characteristics of different alloying element. Lyzer Jominy End Quenching Apparatus (Junior Model) has quick transfer of specimen to quenching fixture within specific time with the special tong. 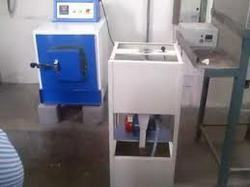 Motorized Water circulation through water pump with storage and test tank.